Registration: Both Grand Teton walks are remote registration only. See our remote registration page for details. We recommend you check the National Park Service page before your trip to make sure the trails you plan to do (and the road to them) are open. See link below. 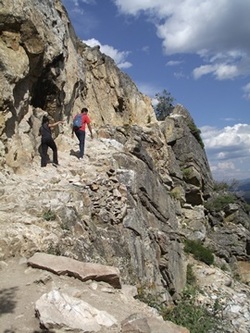 Elevation: These hikes start at an elevation of 6,000 feet or more above sea level. 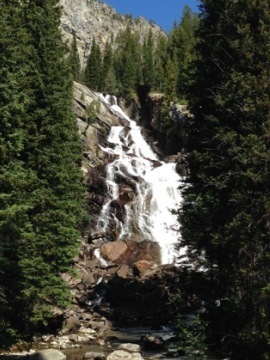 It is recommended that you first acclimatize to the altitude before attempting a moderately strenuous hike. If planning to do both hikes, Two Ocean Lake has a lower elevation and is an easier hike, making it a good “acclimatization” walk. Awards & Fees: AVA/IVV credit only is $3.00. A 100% embroidered patch is available for $7.50 (includes AVA credit). Free walkers are welcome and, like all walkers, must send in a signed registration form. 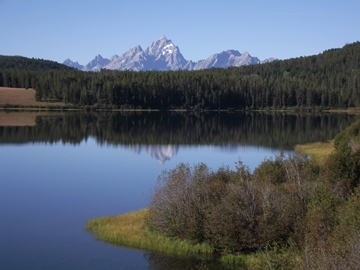 Directions to start point : Grand Teton National Park is located in the western United States. It spans 310,000 acres, 485 square miles. See the link above for detailed directions. Trail: (2B) ​ Round Trip: 6.5 miles. When you think of hiking in Grand Teton, you don't think of gentle trails around forest-lined mountain lakes. This nearly level loop is a perfect early- or late-season altitude acclimatization route. It offers a nice escape from the crowds that flock to trails on the park's popular western side. Arrive early or stay late for the best chance at spotting deer, elk or moose. This trail is almost as flat as the lake, but an out-and-back option up Grand View Point adds about an hour and 700' of elevation gain, if you're in the mood. On clear days, two volcanic outcroppings atop the vista point make scenic picnic spots and offer amazing 360-degree panoramas.